Ron has worked in family law since his graduation from the University of Minnesota Law School in 1982. Collaborative Practice is a home grown concept; it originated by Stu Webb, a local Minnesota attorney and a tenant of Collaborative Alliance, Inc. 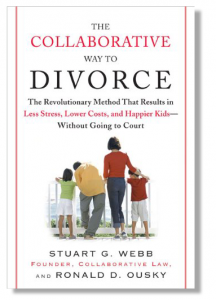 In THE COLLABORATIVE WAY TO DIVORCE: The Revolutionary Method that Results in Less Stress, Lower Cost, and Happier Kids—Without Going to Court (Hudson Street Press; June 2006 , $23.95) collaborative law founder and pioneer Stuart G. Webb & Ronald D. Ousky provide a groundbreaking alterative for the millions of couples with children who face divorce each year—couples who want to avoid litigation, but don’t want to give up on getting what they want. Compassionate, clear, and comprehensive, THE COLLABORATIVE WAY TO DIVORCE is the first trade book to introduce a dignified, highly strategic solution to divorce– the collaborative process, a nationally acclaimed approach that is fast transforming how couples dissolve their marriages, divide their assets, and reinvent their post-divorce relationships, particularly when they share custody of their children. Centered around the understanding that the couple will hire their own individual collaborative attorneys—but all are committed, in writing, to settling their differences out of court–THE COLLABORATIVE WAY TO DIVORCE stresses cooperation over confrontation and resolution over revenge. Most importantly, it keeps children out of the controversy, while protecting their best interests.